Our first apple of the season from the trees in our yard. Since it is my birthday today I thought it would be most fitting to post the recipe to one of my favorite cakes- The Apple Dapple Cake. I found this recipe last year when I discovered what suprisingly delicious apples we have on the two trees in our backyard. I didn't want them to go to waste so I made a point of picking just about every single one as quickly as I could before the deer and birds beat me to it. Well, this left me with a heck of a lot of apples! I needed to get creative, and fast! So right away I made quite a few batches of different types of applesauce (I will give you my favorite recipe in another post later on). But being the fall I was in the mood to bake. 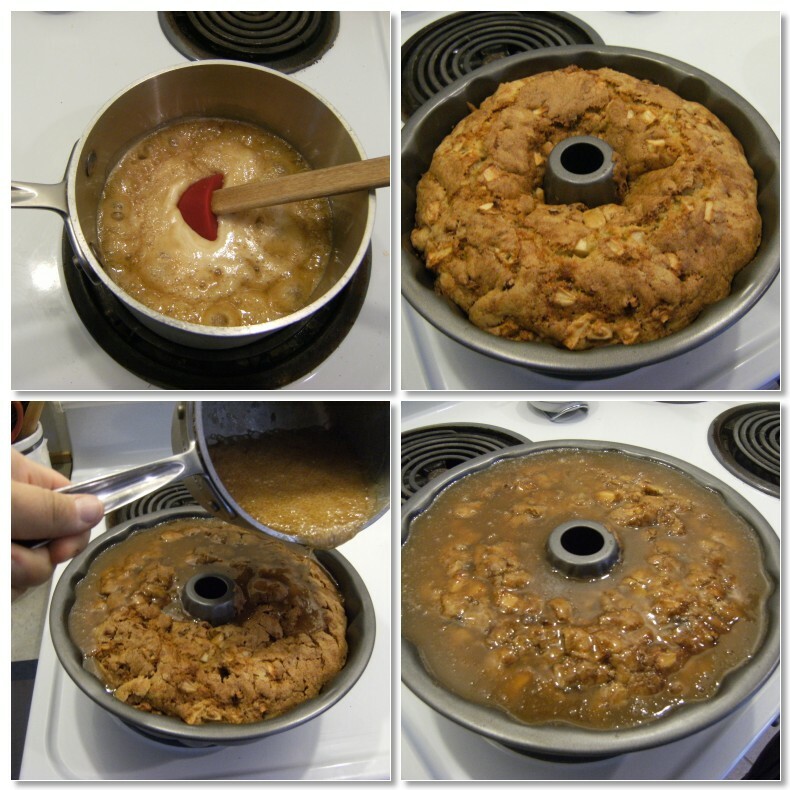 After a little surfing on my favorite cooking websites I stumbled across The Apple Dapple Cake. I loved the name and the recipe was super easy so I thought I would give it a try. One word- Heaven. Even Jackson, who isn't a dessert kid looooooved this cake. It is sticky and moist and the perfect accompaniment to a good cup of coffee. If you want to be super decadent, a scoop of real french vanilla ice cream makes this a little taste of perfect. It never lasts long in our house, so I have been taking to freezing half of it right away in single servings so we can pull it out whenever the mood strikes us. It freezes wonderfully and keeps us from eating the whole thing in under a week! Grease a tube or bundt pan (I like to use Pam or Baker's Joy). Mix oil, sugar, eggs and vanilla. Sift together flour, salt, soda. Add to first mixture. Fold in pecans and apples. Bake in prepared tube pan at 350 for 1 hour. Mix and cook 3 minutes after it begins to gently boil, stirring constantly. With a butter knife, poke holes all over the cake- seriously, go ahead. The more the holes you poke the better. Carefully pour the sauce over hot cake while cake is still in pan. All that wonderful sauce is going to sink into the holes you just poked. Let cake cool completely before removing, at least one hour. The sauce is what makes this cake so fabulous. It will looks like a crazy amount of sauce when you first pour it on the cake, but it will sink into the holes and the cake will soak it all up resulting in the moistest cake you will have ever tasted. As a birthday present to me, bake your family this cake and let me know what you think. You wont be disappointed I promise. I linked up my recipe on Mom's Crazy Cooking! What a picture perfect apple! And from your own back yard to boot -- cannot get better than that! What kind of apples are on your trees? Amie. I have to thank you for this apple recipe. I have about 3 1/2 bushels of apples in my downstairs refrigerator. Rick and I went to the North Georgia Mountains for apples the Friday after Thanksgiving and I had intended to can applesauce and apple butter the next weekend. But then my mom had her emergency surgery and I was called to Florida. Since I have been back I have lost the desire to do it. So I have been trying to be creative in making other things with them along with sharing apples with my friends. I will surely try this recipe - Happy Birthday! what apples would work best? You should have a LIVE baking hour one night... We could all log in and follow you step by step...this would be GREAT for a baking dumb dumb like me! I hope both of you enjoy this cake- it is so wonderful! And Tera, it is so very simple! Even someone who has never baked before could do this fool proof. Trust yourself! Any apple would work well. Just pick your favorite. Although if you go with a tarter apple, combine it with a sweet one too. You will have a more balanced cake. mix and match and have fun!